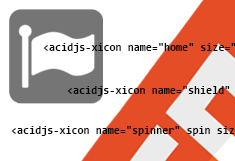 AcidJs.XIcon is another (hopefully) useful HTML5 Web Component for generating icons as custom tags using the amazing icon set of Font Awesome. name – Name of the icon. Check the currently available icons here. If name is not set, a warning will be displayed. spin – The setting of the attribute makes the icon spin continuously. size – Width and height of the icon. Available sizes: "lg" (large, +33%), "2x", "3x", "4x" and "5x". The default size is 16px or 1em. rotate – The setting of the attribute will rotate the icon by the degree value set. Possible values: "90", "180" or "270". flip – Flip the icon horizontally or vertically. Possible values: "horizontal" or "vertical". Check the code of the demo page or the distribution to see how to use X-Icon and have an awesome day!